As Northwest wineries continue evolving, a growing number are installing commercial kitchens for new food programs or larger scale events. The new trend opens the door for restaurant-like experiences amid scenic vineyard stretches or quaint cellars. Enterprising foodies like Timothy Nishimoto and Adam Ruplinger see opportunity in such a direction. The two recently launched Trellis: Curated Wine Dinners, a nomadic food service that brings creative pairing menus to wineries and private residences throughout the region. 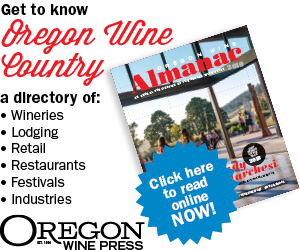 In addition to showcasing Oregon wines and seasonal bites, the company offers a certain intimacy and freshness by furnishing a chef and seasoned wine industry professional to orchestrate the meals. Nishimoto, most famous for his role as vocalist and percussionist with Pink Martini, has worked in the restaurant realm since he was 15. The Portlander founded Vino Paradiso a while back before rebranding the joint to Coppia and hiring Ruplinger as executive chef. The two worked well together and enjoyed matching wines with new dishes. 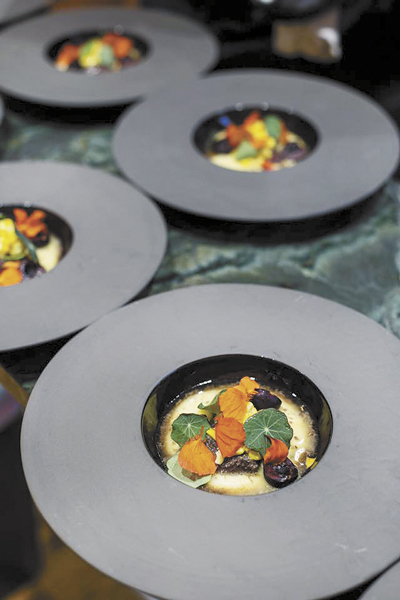 The restaurant was sold in late 2014 but the idea the two often kicked around — to bring their gastronomical prowess to the heart of wine country — persisted. Ruplinger grew up in the Midwest, bouncing around the Minneapolis food scene at restaurants like Auriga and Cocina del Barrio. Nishimoto says Ruplinger was so moved by Hawks View 2009 Pinot Noir, he decided to head west, closer to the source. He entered the kitchen at Coppia in 2013 and began to immerse himself in Piedmontese cooking and local wine culture. More recently, Ruplinger was the executive chef at the Parrott House in Roseburg from its opening in January 2017 to April of this year. Wine country gatherings are certainly gaining popularity, reflecting a still-booming industry. Yet, many venues look to caterers and larger companies for enhanced events or food carts for convenience. Trellis’ packable staff and years of combined industry experience essentially offer a mobile restaurant team with an affinity for Oregon wines. Presently, Trellis is filling its summer calendar with dinners at wineries and homes around the state, including Aug. 4 and 5 at Irvine & Roberts in Ashland. Between roles at Trellis and as the wine buyer for Made in Oregon, Nishimoto continues to tour with Pink Martini as the sprawling Portland band hits the road. There’s been enough interest in the dinners so far that they’re considering merging with wood-fired cooking and catering company Ember & Vine. If successful, the new collaboration would focus on more casual affairs while the Trellis brand would stick to the higher-end meals. Nishimoto’s first wine revelation happened years ago, when he was 21, by way of a Grgich Hills Estate Chardonnay. He’s been drawn to the craft ever since, making wine a major focus at his restaurants and supplementary side projects. Ruplinger and Nishimoto greatly admire the 777 Dijon clone, especially grown in the Eola-Amity Hills AVA. But the duo is also excited by the fringes and some of the lesser-known varieties available. The wines Trellis selects are different for every meal, reflecting a single producer, spanning several styles or viticultural areas. The deep passion they share for wine and its ability to enhance the right dish will give Trellis some added flair as the young company finds its footing. The intimate nature of the meals will make them all the more memorable. 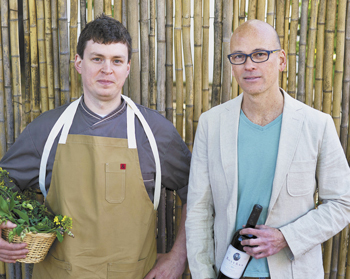 A recent series of summer solstice dinners at Ruby Vineyard in the Chehalem Mountains makes Nishimoto excited about the future.